The loco is in service and worked a freight trip on Saturday 12th April for the D.D.S. on the morning of their AGM and later top & tail with 118 and the DMU running into the night, A start was made over the Easter weekend to get the new livery on the loco for the diesel gala. After the rubbing down and some undercoat had been applied the loco was placed in the tin P.L.O.G. shed. By the start of May the painting was all but finished. The name "RIVER DART" was applied on the Wednesday afternoon (7th) and on Friday evening (9th) the nose end doors which would have had a Tinsley rose on, had a Primrose put on instead for the line it works over! 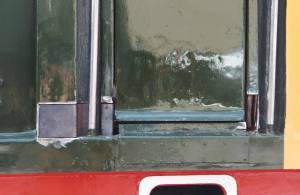 And the shed code which goes between the cab windows should be 41A for Tinsley is not, nor is it 83J (Buckfastleigh) instead it is 72A for Exmouth Jct., Exeter? Exmouth Jct. 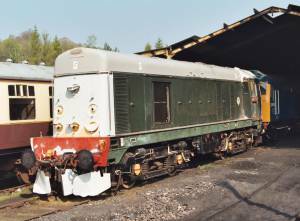 only had class 08 shunters allocated to it and then it was 83D, so why 72A? Well it was the only thing going at the time! The loco worked well over the weekend. The headboards carried on the loco for the "The Three to the Sea" in the evening on Saturday were the originals from the Sheffield to Brighton trip and supplied by the Class 20 Society, who own them. The Society also had their sale stand out on the platform on Saturday. A start was made to re-place the engine compartment door seals on Sunday 1st June, with the tops and left hand side being treated first. The right hand sides with be done at a later date, as the doors have to come off. D8110 is prepared for repaint Even Diesels suffer from body rot ! Appropriate name for "Three to the Sea"
Worked on the D.D.S. 's AGM day (as above) without fault. It was placed at the Totnes end with 110 Buckfastleigh end so both loco's were cab leading. The loco also worked for the Railway's Easter Transport Gala on Sunday & Monday 20/21 April, plus the Thomas weekend on 3/4/5 May. 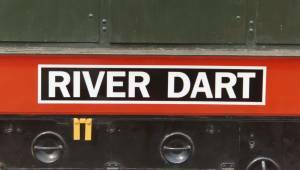 The "RIVER DON" name was re-applied (with double sided tape) to the loco and "SALTBURN-BY-THE-SEA" covered over. Again this was done Wednesday afternoon. The loco worked well over the weekend. The only thing that will need to be looked at is the power control. This was found to fluctuate about 200 to 300 amps when under power. The following Sunday the loco had it's old name back and the stuck on names peeled off, but on one side some touching up is needed as some paint has come away. The loco worked over the 1950's weekend on the Monday 26th May. The cab heaters were electrically tested on 15th June with ambient temperatures in the cab of over 30C! The cab end was also covered up on this date, until it's next working, this will help keep the sun from fading the yellow paint. No change with this loco as yet. The loco had some fuel put in the tank for the first time on Sunday 4th May. Not bad as the loco has been here for ten plus years. It was planned to have the loco's engine running over the gala weekend, but due to charging problems it was not possible. It was, however, started on the Monday after the event and started first time. It was then left to run for about one hour. right. It would appear that the stop solenoid was at fault, once again. Hopefully this will last a while as the unit will be seeing some use starting next month on the evening service. Work started in April on marking and cutting out of the new ceiling panels. Fitting these panels started at the beginning of May, with a short break over the gala weekend, as the unit housed the `O' gauge railway "Higher Trelavour" that was on show to the public. 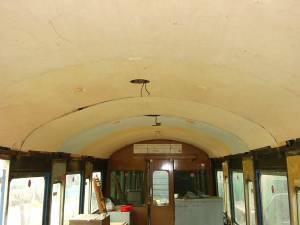 By mid June the ceiling panels had all been fitted. Has seen some limited use as it has had to come out of it's shed to make way for D8110, which is now 20110. Now out shopped in B.R. green livery, but was unable to take part in the D.D. 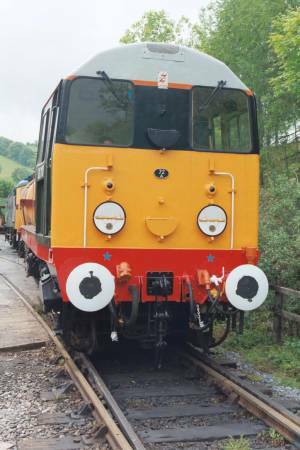 S.'s AGM day on 12th April due to running in of a new bearing which means yard work at Buckfastleigh during April to get the bearing bedded in. The loco made it's first trip down the line on the Saturday 3rd May to give brake van rides at Totnes for the Thomas weekend and all went well with the new bearing running cold. It was stabled at Staverton each night. After shunting and the odd passenger turn over the gala weekend the loco had it's control air system check over for leaks. One leak was found on a pipe to the forward/reveres piston this turned out to be a broken union joint. A temporary repair was done so the loco could move. This was later repaired the following weekend. The loco had it's engine oil changed mid June, along with the compressor and exhauster. Still no news on this loco, as yet. But next time their should more than one line! MINK W 104700 - Waiting the fitting of some new wooden strips over the doors. It formed part of the van train over the gala weekend. CCT W94556 - No change. The gala weekend had this van out and about. By min June it was found that the new paint on one of the new panels that was welded in over last Christmas had not taken. When the paint was peeled off it was all wet behind it. This panel has now been repainted. SHOCK - This van also had a spin out and about over the gala weekend. MINK `B' (W125814) B753100 - Had it's first run out over the gala weekend in the van and the mixed passenger trains. 20166, 33110 & 47279 like our own loco's all the visiting loco's worked without fault or failure. 201 b6 worked on reduced power as a turbo has a bearing that's is about to fail. It had it's two turbo's replaced at the ,start of the year due to both having coolant leaks. 33110 has it's electric heating isolated and both 20 & 33 have defective speedo's. 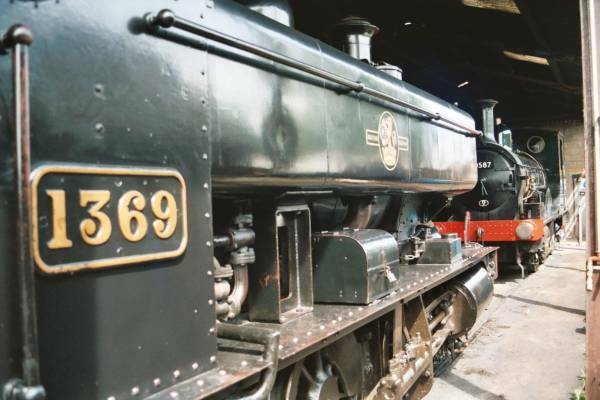 These two locos came up from the Bodmin & Wenford Railway in Cornwall. 47279 came light loco from Dagenham, stopping at Exeter for a body and bogie clean. It was restricted to the Staverton to Totnes end of the Line and saw limited use on both days. It was also .suffering from a reverser fault. which meant it had to be reversed by hand in the engine room. The loco is a Freightliner owned loco and it was used to tow the 20 & 33, to and from the B & W Railway. See Sunday trains below. Also Branch Line Weekend 24th & 25th Aug. and Transport Heritage Weekend 20th & 21st Oct. The main working Sunday will be the first one on the month, but most Sundays will see someone around if you turn up between 09.00 and 09.30. All help most welcome. FIRST SUNDAYS OF THE MONTH:- 6th July, 3rd August, 7th September & 5th October. Sundays - 6th July 25901, 3rd August 20118, 7th September 25901, 5th October 20118. 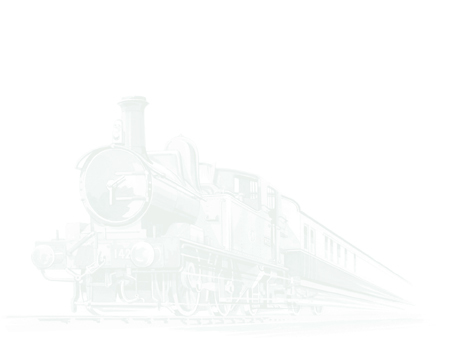 Buckfastleigh Dep. 10.04, 11.30, 13.00 & 15.00.